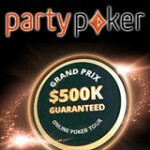 Two new promotions in August, Happy Hour Party Poker and GOTM (Game of the Month) is Rapid500 tournaments. Earn up to 40% more PartyPoints in the Happy Hour Party Poker promotion which runs daily in August during the Happy Hour times. 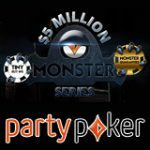 The PartyPoker game of the month is the Rapid500, a series of daily tournaments in a fast paced format. 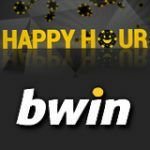 Players can earn more partypoints while playing poker online in the Happy Hour Party Poker times during August, there are three daily happy hours to suit players of all time zones. Points are determined by the players loyalty level, the higher the level the higher the percentage of points you earn. Take advantage of happy hour with three hour long sessions running everyday in August for players to earn more partypoints. 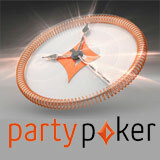 Note than there is a daily limit to how many points you can earn per day based on your PartyPoker loyalty level. 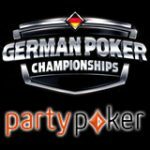 The Party Poker Game of the Month for August is Rapid500 tournaments which are hyper poker tournaments with three minute blind levels. 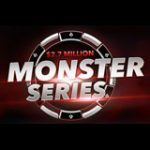 The tournaments are fast paced games providing tons of action plus rebuys are available to give players more chances to stay in the tournament and boost the guaranteed prize pool. 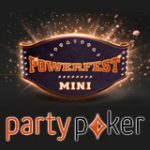 Get a PartyPoker bonus when making your first deposit, bonuses and codes are available for specific countries, see below for more details.